So here’s what I want you to do, God helping you: Take your everyday, ordinary life—your sleeping, eating, going-to-work, and walking-around life—and place it before God as an offering. Embracing what God does for you is the best thing you can do. Don’t become so well-adjusted to your culture that you fit into it without even thinking. Instead, fix your attention on God. You’ll be changed from the inside out. Readily recognize what God wants from you, and quickly respond to it. Unlike the culture around you, always dragging you down to its level of immaturity, God brings the best out of you, develops well-formed maturity in you. Lent begins tomorrow, February 10th, Ash Wednesday. Lent has become a time for taking up a spiritual practice and/or laying down a habit. In years past, we have encouraged each other to take up specific practices focused on the inner life (prayer and meditation) or the body (giving up a specific food and fasting). This year, we focus on practices to encompass the heart, soul, strength and mind as we encourage the whole congregation to enter a prayerful life together of moving and eating. 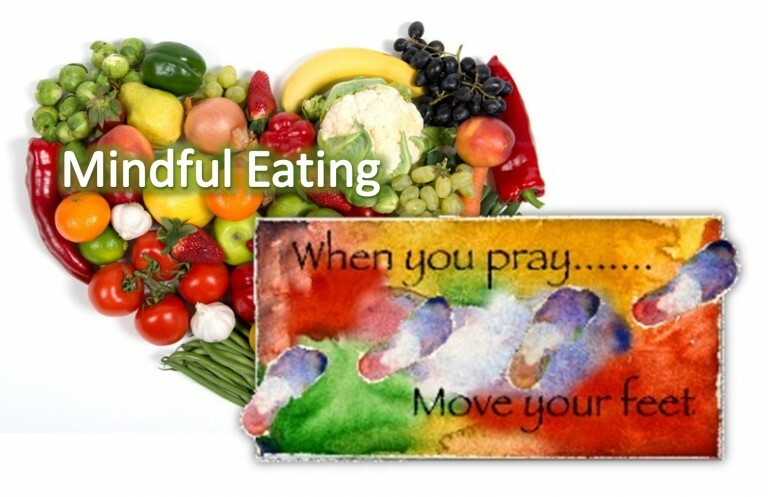 What is Prayerful Moving and Mindful Eating? Every 15 minutes of sustained movement – walking, biking, yoga, dancing, ping ponging, gym activities, etc. – is a step. Group activities will be offered at church. Before you begin, read or say the scriptures – Romans 12: 1-2 1 and Thessalonians 5: 11. Set a time when you will actually go moving. It’s ok to get with others and go walking, dancing, yoga time, playing ping pong, etc. Encouragement and support comes from even having one more person with us as we move together. While you’re moving, enjoy your body’s ability to move even one small muscle, let alone the many it takes to move a limb. If you are with others, enjoy their company. Smile. If you are on a prayer walk, be attentive to what is around you and pray for others you see and wholeness for all. When you finish, celebrate what God is doing and offer a prayer of gratitude (silent or out loud). Every day you eat 3 servings of fruit and 5 servings of vegetables you can record a day completed. A typical serving is ½ cup. Those who need special nutrition (diabetes, etc.) can, with physician’s advice, determine what they need and record appropriately. More detailed information on nutrition is available on www.choosemyplate.gov. Reserve a time for eating. Turn off electronics. Prepare and put food on a table. Sit down and notice the food in front of you. Pause to breathe and smile – a moment of peace and prayer. As you eat your meal, notice the sounds, colors, smells and textures as well as your mind’s response to them, not just the taste. When you put the first bite of food in your mouth, pause briefly before chewing and notice its taste as though it was the first time you had ever tasted it. Choose smaller bites and chew them so as to fully experience the taste. Eat with gratitude: this food is a gift from the earth, the sky, the numerous living beings and much hard, loving work. How do we record what we’ve done? We will record our offerings on the bulletin board at the west entry of the church. Watch what changes from the inside out as we journey through Lent together. During Lent there will be opportunities to get together to support one another along the Lenten journey. One such opportunity is Monday Movement at Ada Haden Lake. Mary Gregory will lead a group in a prayerful walk around the lake at 12:15pm. You can meet there, or meet at the church at noon and carpool. In case of adverse weather, we will walk in the church. If you think of other ways to encourage and journey with one another, start a group or activity and invite others.